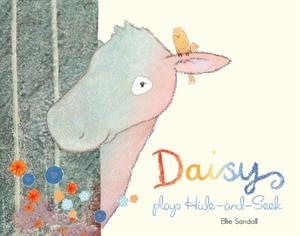 I fell in love with Ellie Sandall's artwork when I read and reviewed Birdsong last year. So when I saw that this talented writer/illustrator had created Daisy plays Hide-and-Seek (Egmont 2011), I snapped it up with delight. Daisy is a very special cow. Like a chameleon, she can take on the colours of the things around her, which makes her extremely good at playing hide and seek. Will her friend, Jake, be able to find her? Will you? Like most boys his age, Jake is easily distracted. This combined with Daisy's special magical camouflage makes finding Daisy difficult. Kids will delight in pointing Daisy out to Jake - and to Mum, Dad, Grandpa and the lady next-door! This is a simple, gentle story, but one that will be read over and over again. There are also lots of opportunities for kids to learn new vocabulary, and relate textures and colours to their own lives and art. I love the clever use of media in this book, with lots of fascinating elements to examine and analyse. Did Sandall use collage for this illustration? Did she add sponge? Is this water colour alone, or is that a crayon rubbing? Daisy gives youngsters pages of opportunities to look at different art and be inspired by it - young artists will enjoy finding Daisy camouflaged by so many different patterns and styles. There are also lots of contextual clues and detailed illustrations to help children read the book independently. I love picture books that do double duty like this - perfect for reading aloud, but after lots of repetitions, they become almost memorised. This makes them ideal too for children ready to take that next vital step in learning to read. I think you and your kids will enjoy Daisy plays Hide-and-Seek - I know I did! It's an excellent resource for teachers and parents who want to teach kids about camouflage, and about not giving up when you can't do something immediately. It would make an excellent prequel or sequel to your next game of hide-and-seek with your kids. Here's a review of Daisy plays Hide-and-Seek from Zoe at Playing by the book with details of some wonderful hide-and-seek activities she did with her daughter.